Traditional hard drives with moving components are the same today as when they were first created decades ago. Granted the storage capacities have increased tremendously compared to the days of a megabyte hard drive. You will even be hard pressed to find a 250GB hard drive retail today. Traditional hard drives will have the same hardware inside the casing. When first opening you will notice large metallic platters around a spindle. On top of the platters are a large arm actuator sits with micro heads on the tip of the actuator. Typically, these is the first place to look when hearing hard drive clicking sounds. Opening a hard drive yourself is not recommended and calling a computer hard drive recovery professional is paramount. Depending on the storage capacity of your hard drive will determine the number of platters ‘metallic disks’ sitting around the spindle. Today with 8TB and larger drives on the market you can quickly see how cramped the spacing is within these platters. The platters are where the data and firmware reside for your hard drive. If the damage to the hard drive was caused by dropping your laptop for example. A professional data recovery services technician will see metallic dust on the filter and sometimes all throughout the inside of the hard drive casing. Most likely when this is noticed the drive will be unrecoverable due to the tremendous damage to the platter surfaces. The dropped laptop caused hard drive clicking and now the arm actuator is stuck. The arm actuator as seen in the picture on the page is where the heads reside for the hard drive. The heads are where the data is transferred to and from the hard drive. When the laptop was dropped as in our example the heads will have crashed into the platters causing tremendous surface damage due to the high rate of speed the platters rotate on the spindle. When the arm actuator was forced due to impact you now hard drive clicking sound due to arm attempting to move back into the park position but is now damaged. The arm itself is not damaged but the heads at the tip are. These will need to be replaced. Keep in mind that the top surface of the top platter is not the only platter that needs inspected. The top and bottom of each platter needs inspected for microscopic damage due to heads scrapping the surfaces upon impact. Data is stored on the top and bottom of each platter. There is a head that is designated for each surface of each platter. Repeated attempts to boot hard drive when hard drive clicking occurs will cause more damage and may end up rendering the hard drive unrecoverable. On the outside of the hard drive you will see a green board attached with screws. This is the PCB for the hard drive. The PCB is the circuitry for the drive and this can also cause a hard drive clicking sound. When swapping out the PCB the ROM chip will need to be replaced and added to the new board as well. Failing to swap the ROM will prevent access to the stored data when attempting advanced data recovery. Contact Data Recovery Cincinnati LLC today if you have any further questions about your specific hard drive. We are happy to answer any questions you may have. 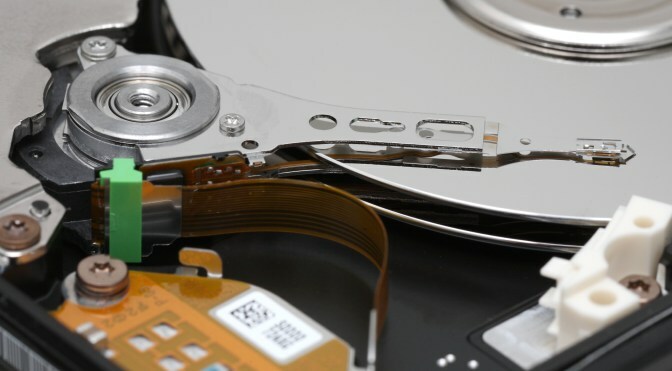 Even though all hard drives are built the same each recovery is different and may need various tools and methods to successfully extract your data. Call us today at 513-338-9756. Hard Drive Clicking.